Wearing a Soviet-style hat typical among Chinese farmers in winter, 40-year-old Jiang Jinchun, from a mountain village in Hengfeng county in East China's Jiangxi Province, scoops up some snow outside his home with a pair of chopsticks and swallows it with a contented expression, as if he were eating something really delicious. The short video, less than 15 seconds in length, is one of several the farmer has recently uploaded to Kuaishou, a short video and livestreaming app. "Thank heaven for bringing snow! There will definitely be a harvest next year," he commented under the video, which soon amassed 7,921 likes and 1,799 comments. China's livestreaming and short video platforms may be best known for bringing wealth and fame to young, pretty female presenters, who get rich by livestreaming themselves singing and chatting with fans, or just showing their daily lives. But the apps are also bringing prosperity to an unlikely group: farmers. Three years ago, Jiang was a farmer with little hope for his own future. Today he has managed to attract over 2 million followers on three major short video and livestreaming platforms. His fans and followers are also loyal customers. Through the apps, Jiang has sold 1,050 kilograms of tea, 600 kilograms of kudzu root powder (a plant known in China to have health benefits) and over 200 kilograms of camellia oil produced by over 200 households in 14 villages in his county in 2018, making him a local business star. Last year, he was even given an award by his county chief and a prize of 18,888 yuan ($2,792) for helping the county sell agricultural products. Most of Jiang's videos depict life in his village, including him cooking meals using local produce with his family or digging for bamboo shoots in the forest, with his dramatic facial expressions adding a personal touch to the videos. "Most of my followers are people from rural areas who are now working in the city, and my videos remind them of rural life," Jiang told the Global Times. Jiang is among a growing number of farmers who are now benefitting from e-commerce through livestreaming and short video apps. In 2018, over 16 million people received income through Kuaishou, including 3.4 million from China's impoverished counties, according to a spokesman from Kuaishou. Over 100,000 farmer livestreamers have registered on Alibaba in the past three years, according to Nongmin Daily. Li Xiaoyun, professor at the College of Humanities and Development Studies at China Agricultural University, told 21st Century Business Herald that livestreaming is an innovative method for poverty reduction, as it not only simplifies the buying experience by cutting out intermediaries, but also makes supply and demand information more transparent. Jiang's success story may sound tempting, but like most young males in rural areas, he used to be a migrant worker trying to carve out a living in the city. In 1998, 19-year-old Jiang, like most of his fellow villagers his age, left his hometown for the city for better prospects. For nearly 11 years, he was a delivery man in Yiwu in East China's Zhejiang Province, home to the world's biggest wholesale market, where huge amounts of goods need to be delivered every day. While he managed to get by, after he got married and had a daughter, he faced a conundrum that troubles many migrant workers: what to do with the child. Since he and his wife were too busy to look after her, they had no choice but to send her back home and ask his parents to take care of her. "My wife cried all the time. We were left-behind children ourselves when we were growing up, so we know what it's like to grow up without parents by our side," he told the Global Times. In 2010, despite bleaker economic prospects in his village, Jiang and his wife finally decided to return home to look after their child. To make a living, they opened a shop on Taobao, selling clothing he bought wholesale from Yiwu. But business was mediocre, with only a handful of orders each month. Change occurred in 2015. That October, a friend encouraged Jiang to register on Kuaishou, and Jiang started to post videos of his rural life. One day, a video of him digging up bamboo shoots with his father suddenly became popular, attracting dozens of new fans every day. Some asked him if he could sell them. Jiang now earns 170,000 yuan a year, four times the amount he earned as a migrant worker, and he enjoys the benefits of having his family by his side. 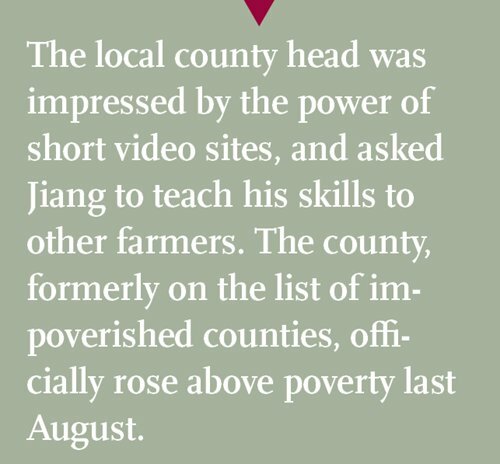 The local county head was impressed by the power of short video sites, and asked Jiang to teach his skills to other farmers. The county, formerly on the list of impoverished counties, officially rose above poverty last August. "If you only have a shop on Taobao, no one knows who you are, and they can only judge a product by photos and descriptions. Livestreaming brings more humanity and trust to e-commerce," Jiang said. The promise of livestreaming has attracted many farmers with business acumen to return to their hometowns. Shang Yukang, aged 23, is the only young person in Baimasi village in Longnan, Gansu Province. Born in 1996, he left home and became a migrant worker when he was 16. He has worked as a dishwasher in Beijing, a worker at an electronics factory in Suzhou and a laborer at a construction site in Guangdong, before he became tired of migrant life and returned home to a village mostly inhabited by old people and children. He now owns a chicken farm in the village. 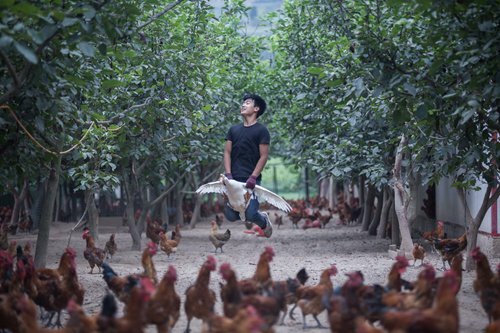 By posting creative videos of his chicken on Kuaishou, including videos featuring the birds in different formations, such as a heart or a Chinese character, he has managed to attract 370,000 followers, who contribute greatly to his annual earnings of 100,000 yuan. 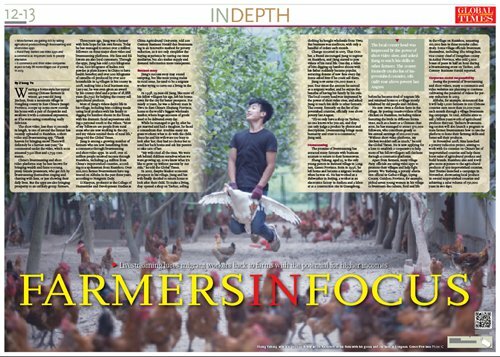 "Without short video platforms, my chicken wouldn't sell as much," he told the Global Times. He is now applying for a loan to establish a cooperative to help more of his fellow villagers sell chickens through e-commerce platforms. Apart from farmers, many village Party officials are using video apps to promote their villages and help fight poverty. Wu Yusheng, a poverty alleviation official in Gaibao village, Liping County, Guizhou Province, for example, picked seven young women in his village to livestream the culture, food and life in the village on Kuaishou, amassing 110,000 fans in three months collectively. Some village officials livestream themselves, including Zhu Mingchun, vice county chief of Dangshan county in Anhui Province, who sold 5,000 boxes of pears in half an hour during a livestreaming event on Taobao, 21th Century Business Herald reported. Seeing the potential of livestreaming and short videos, many e-commerce and video websites are planning to continue cultivating the potential of videos for poverty reduction in 2019. Alibaba, for example, announced that it will help 1,000 farmers in 100 Chinese counties earn more than 10,000 yuan each month through a village livestreaming campaign. In total, Alibaba aims to sell 3 billion yuan worth of agricultural products this year. Taobao's livestreaming section will also launch a program to train farmer livestreamers how to use the platform to hone their farming skills and better sell their products. In November 2018, Sina launched a poverty reduction project, aiming to work with 60 counties on China's list of impoverished counties and help them boost sales of agricultural produce and build brands. Kuaishou also said it will give more exposure to the agricultural products of 500 impoverished counties. Jinri Toutiao launched a campaign in November, showcasing local produce in several impoverished counties and achieving a sales volume of 150,000 yuan in two days.